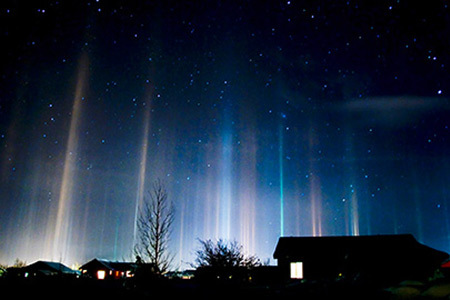 A light pillar is basically a visual phenomenon created by the reflection of light from ice crystals with near horizontal parallel planar surfaces. The light can come from the Sun (usually at or low to the horizon) in which case the phenomenon is called a sun pillar or solar pillar. 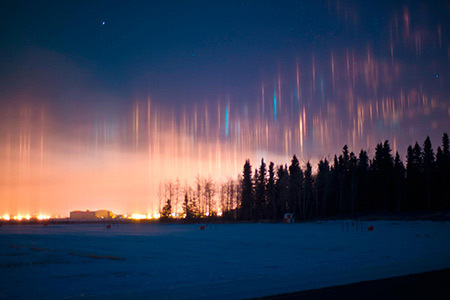 Continue reading for five more incredible facts you may not have known about this natural phenomenon.The light pillar looks like a thin column that extends vertically above and/or below the source of light. 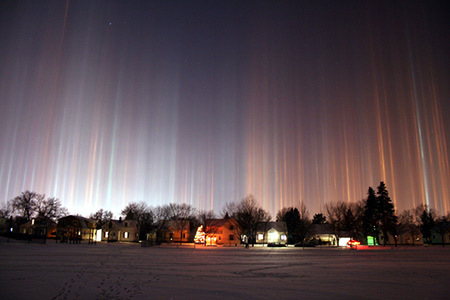 The light pillar is prominently visible when the Sun is low or lies below the horizon. It normally forms an arc that extends from five to ten degrees beyond the solar disc. 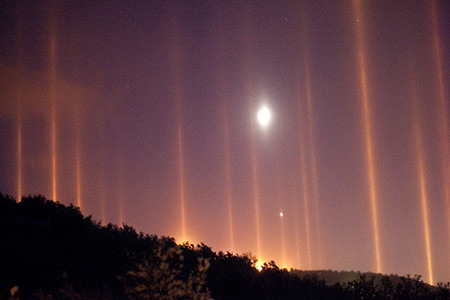 Light pillars can sometimes also be seen arising from the Moon.Light pillars have also been known to produce false UFO reports. Niagara Falls is one such area, where the mist from the Niagara Falls causes the phenomenon to appear frequently during the winter months, where the ice crystals interact with the citys many upward facing spotlights to create prominent light pillars.Light pillars are a kind of optical phenomenon which is formed by the reflection of sunlight or moonlight by ice crystals that are present in the Earths atmosphere. 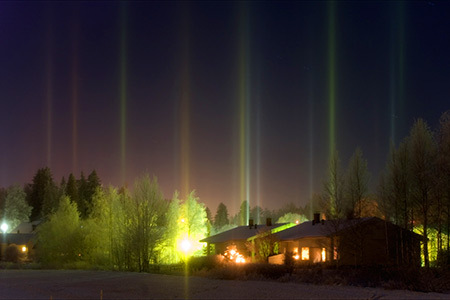 They are also called the crystal beam phenomenon.Light pillars are formed by reflection from ice crystals with roughly horizontal faces and could also be formed by man-made light sources, such as streetlights.Since the light rays forming pillars are reflected, they take on the color of the incident light. 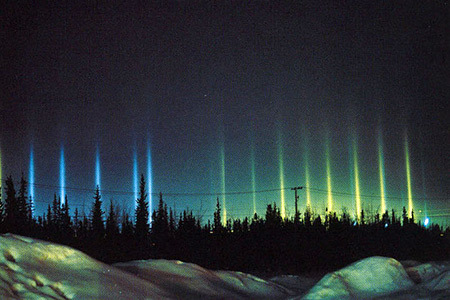 One good example is when the sun is higher in the sky, pillars are white or bright yellow in color. But when it is near the horizon and its light color dominantly orange, gold or red, so is the resulting pillar.